There isn't anything worse in this world than having to deal with a hungry zombie, constantly moaning while trying to take a big ol' bite out of your brain, or having to deal with a hungry cat, that just won't quit it with the sorrowful meows and the destructive tendencies towards your property in order to gain attention. That is there wasn't anything in this world quite as (somewhat...) terrifying (...but mostly just annoying) until now. We present a combination of the two beast and give you the Zombie Cat! Now you can hope that this monster would prefer to eat the living of its own species but something tells us that this bottomless pit of hunger would develop a taste for human flesh in no time! 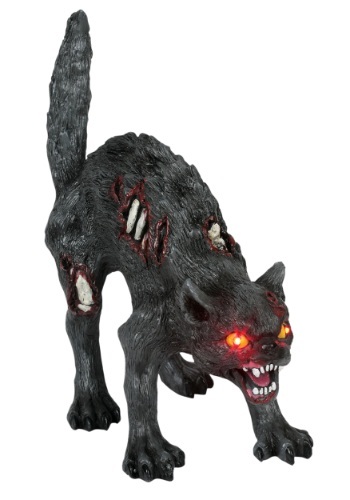 So thankfully we just have decorative statues of the little abominations here and you can use them to perhaps ward off any possible zombie cats in the future, or even just to scare away those pesky neighborhood kids that choose to do tricks rather than receive treats.